Choose the right filing method, right forms, and get everything done on time, easily. Due date for filing with SSA. The due date for filing 2018 Forms W-2, W-2AS, W-2CM, W-2GU, W-2VI, W-3, and W-3SS with the SSA is January 31, 2019, whether you file using paper forms or electronically. Extensions of time to file. Extensions of time to file Form W-2 with the SSA are no longer automatic. You may request one 30-day extension to file Form W-2 by submitting a complete application on Form 8809, Application for Extension of Time To File Information Returns, including a detailed explanation of why you need additional time and signed under penalties of perjury. The IRS will only grant the extension in extraordinary circumstances or catastrophe. For more information, see the Official W2 Instructions for 2018. To aid victims of Hurricanes and Tropical Storms Harvey, Irma, and Maria, and the 2017 California Wildfires, a leave-based donation program is in effect for 2018. Under these programs, employees may donate their vacation, sick, or personal leave in exchange for employer cash payments made before January 1, 2019, to qualified tax-exempt organizations providing relief for the victims of these disasters. The donated leave need not be included in the income or wages of the employee. The employer may deduct the cash payments as business expenses or charitable contributions. For more information, see the Official W2 Instructions for 2018. The Tax Cuts and Jobs Act (Public Law 115-97) temporarily suspends the exclusion for qualified moving expense reimbursements under section 132(a)(6) and (g). However, the exclusion still applies for a member of the Armed Forces of the United States on active duty who moves under a military order to a permanent change of station. This change is effective for taxable years beginning after December 31, 2017, and before January 1, 2026. For more information, see the Official W2 Instructions for 2018. For members of the Armed Forces performing services in the Sinai Peninsula of Egypt, the Tax Cuts and Jobs Act also temporarily makes the Sinai Peninsula of Egypt a qualified hazardous duty area. Treat this hazardous duty area as a combat zone for the exclusion from income of certain combat pay under section 112 and exclusion from wages under section 3401(a)(1). For purposes of withholding, this change generally applies to remuneration paid during the period December 22, 2017 through December 31, 2017, and taxable years 2018 through 2025. For more information, see the Official W2 Instructions for 2018. Also, employers must report the aggregate amount of income which employees elect to defer under section 83(i) as of the close of the calendar year in box 12, using code HH. For more information, see the Official W2 Instructions for 2018. Failure to file and failure to furnish penalties, and penalties for intentional disregard of filing and payee statement requirements have increased due to adjustments for inflation. The higher penalty amounts apply to returns required to be filed after December 31, 2018. For more information, see the Official W2 Instructions for 2018. Public Law 114-113, Division Q, section 201, requires Form 1099-MISC to be filed on or before January 31, 2019, when you are reporting non-employee compensation payments in box 7. Otherwise, file by February 28, 2019, if you file on paper, or by March 31, 2019, if you file electronically. The due dates for furnishing payee statements remain the same. This due date change initially occurred in 2016. Here is a great article from Entrepreneur Magazine about who is required to file 1099 forms and why, the exceptions and how you can be proactive about 1099s to protect your business from large penalties. Due to the passage of the Tax Cuts and Jobs Act, P.L. 115-97, the last bullet point in "Exceptions" under "Points" has been changed to the following: "Generally, to acquire a principal residence to the extent the points are allocable to an amount of principal in excess of $750,000." For more information, see the Official 1098 Instructions for 2018. 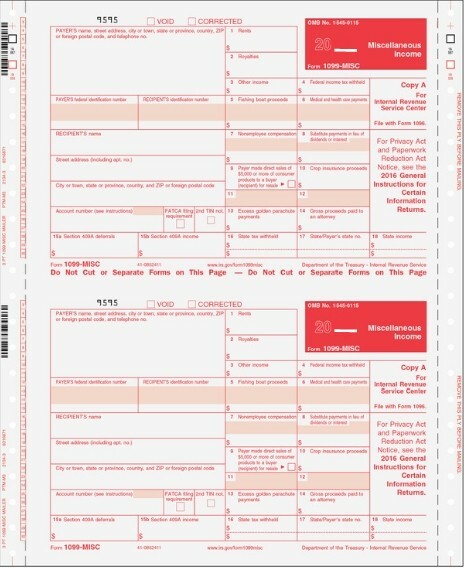 Boxes 9 and 11 of Form 1042-S have been switched and clarifying language has been added to those boxes on the form. Clarifying language has also been added to boxes 7b and 10 of the form. These instructions have been revised to modify and add certain definitions. New sections Requirement To Withhold and Before Completing Form 1042-S have been added to clarify a withholding agent's obligations under chapters 3 and 4 and provide general steps that should be considered when completing Form 1042-S. The income codes, exemption codes, recipient status codes, and LOB codes have been moved to the end of the instructions. Appendix C has been added. It provides an expanded Example 1, which explains how to complete Form 1042-S for a payment of U.S. source;FDAP income made directly to a beneficial owner. Appendix D has been added. It provides a comprehensive example of how to complete Form 1042-S for gambling winnings made directly to an individual. Changes to withholding rates. For tax years beginning after December 31, 2017, the rate of withholding under section 1446 by a publicly traded partnership on a distribution of income effectively connected to a U.S. trade or business has changed to 21% for corporate partners and 37% for all other partners. Changes to codes. To reflect changes made to the chapter 4 regulations regarding U.S. branches of foreign entities that act as intermediaries, chapter 4 status codes have been added for U.S. branches treated as U.S. persons and U.S. branches not treated as U.S. persons that are reporting under Regulations section 1.1471-4. Finally, the LOB Treaty Category code for individuals (code 01) has been removed. For details, see the Official 1042-S Instructions for 2018. Your accounting software is the first step to filing 1099 & W-2 Forms the easiest way. You have 3 main options. If your accounting software prints 1099 & W-2 Forms, you can purchase compatible forms and envelopes. The program will summarize all of the wage data for the year, then print recipient and government copies. 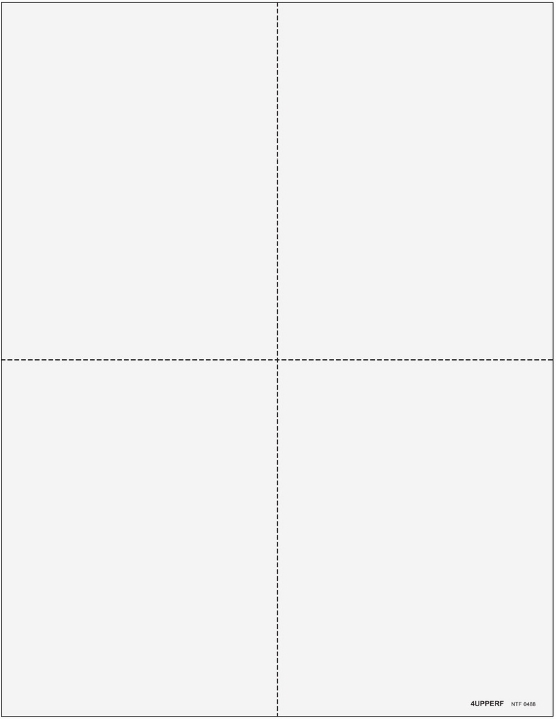 Important: Forms must the layout used in your software. If your accounting software does NOT print the forms, specialized 1099 & W-2 software is ready to help! Import wage data, or manually enter it into the system. Then, print the 1099 or W-2 forms you need. 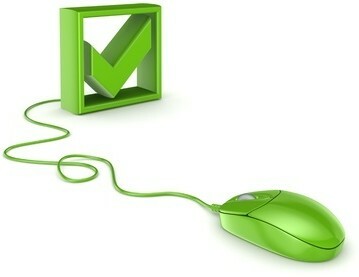 E-filing is also typically available. Be sure that forms are compatible with the layouts programmed into the software. The easiest way to file less than 50 forms is online! 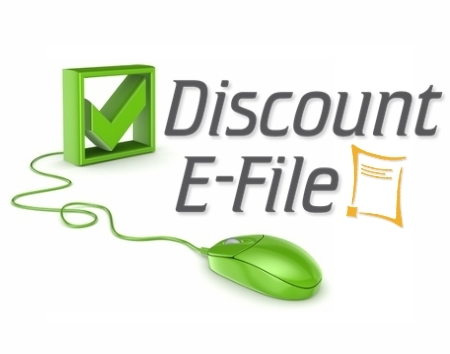 Discount E-file takes care of printing and mailing recipient copies for you, plus e-files with government agencies. You simply import or type in data and we do the rest! E-Filing is required for 250+ forms, but you can e-file as few as one! Select the right type of 1099, in the right format, for easy printing and mailing. 1099-MISC forms are the most common for construction companies. They are used to report payments made to subcontractors and consultants. You must file a 1099MISC if you've paid $600+ to an individual who is not an employee during the tax year. There are many other types of 1099 forms used for other purposes. Here is a list. The number of parts you need is based on which government agencies you need to file with - Federal, State, and/or City. Get the details on your options and regulations on our blog post "Decoding 1099-MISC Requirements"
Preprinted 1099 Forms are for software that only prints the data. Boxes are preprinted on the form and recipient instructions are preprinted on the back. 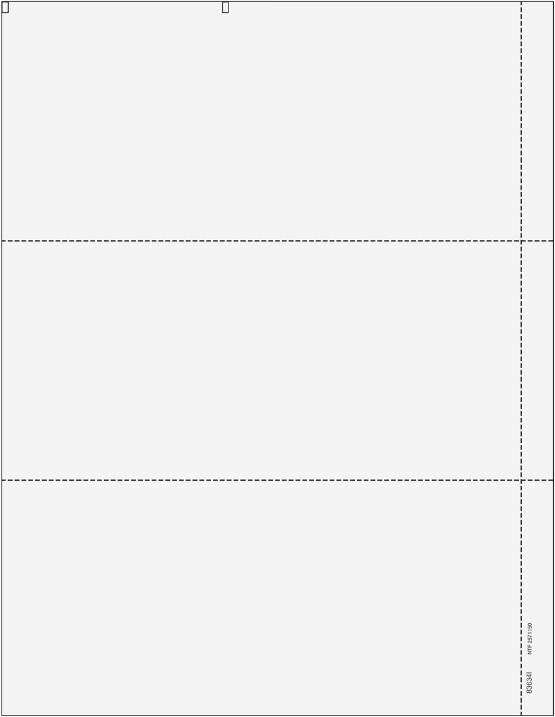 Blank 1099 form paper is for software that prints form boxes and data. Recipient instructions can be printed on the back. If they aren't, you must supply them per IRS regulations. 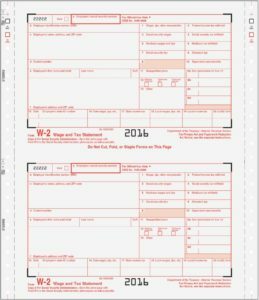 Continuous, pin-fed 1099 forms can be used with typewriters or dot-matrix printers. Use compatible envelopes to ensure the recipient and return addresses show through the windows correctly. When mailing 1099 Copy A forms to the IRS, include one 1096 form for each payer. 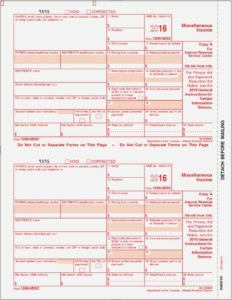 This form summarizes all of the 1099-MISC submitted by the payer. Check out our blog post "How to Print 1099-MISC with QuickBooks"
Select the right type of W-2, in the right format, for easy printing and mailing. The number of W2 parts needed depends on which government agencies you must report to. Get the details on your options and regulations on our blog post "Decoding W-2 Requirements"
Your W-2 Software will determine which forms to use. 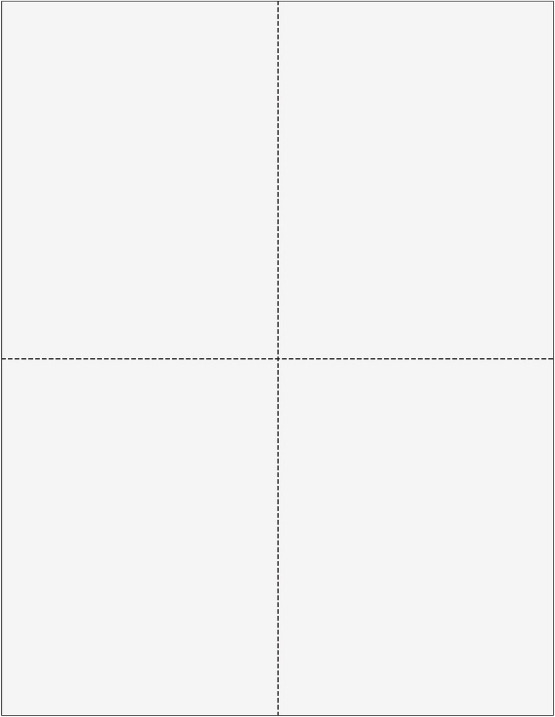 Each software supports different tW-2 layouts. 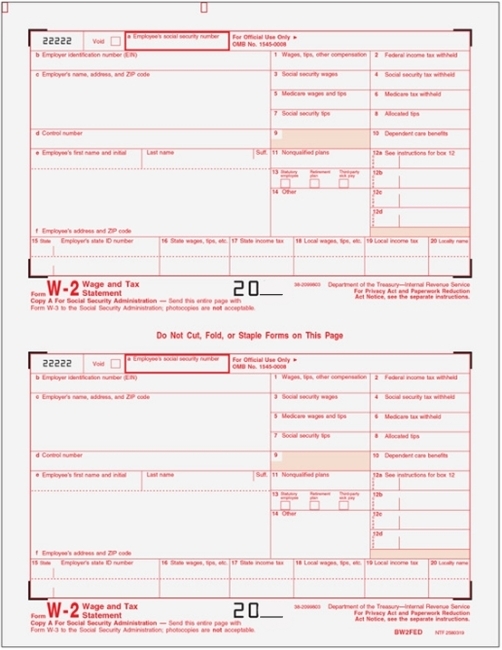 First, check to see if you should use blank W-2 paper or preprinted forms, then determine which layout you need. Many systems support Official W2 Forms, as well as 2up, 3up or 4up condensed formats. The best way to ensure compatibility is to print a sample form and use it to compare when shopping. Preprinted W2 Forms are for software that prints the only the employee data. Boxes are preprinted on the form and employee instructions are preprinted on the back. 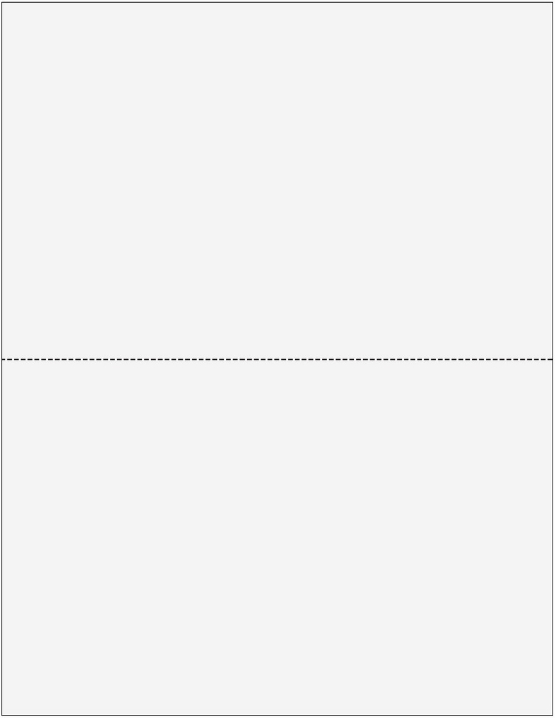 Blank W2 paper is for software that prints the boxes and data. Employee instructions are often printed on the back. If they aren't, you must supply them per IRS regulations. Use compatible envelopes to ensure the employee and return addresses show through the windows correctly. When mailing W2 Copy A forms to the SSA, include one W3 form for each payer. This form summarizes all of the W-2 forms submitted by the employer. NOTE** All Government Copies MUST be printed in 2up layout.